The management of National Food Company wants a 10% rate of return on capital investments. 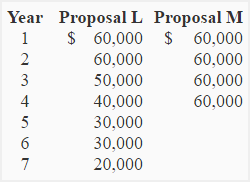 The two proposals have unequal useful lives and therefore their net present value cannot be directly compared. To make the proposals comparable, we assume that proposal L is terminated at the end of 4th year which is the end of the life of proposal M. For this purpose we have to estimate the residual value of proposal L and assume that the proposal is sold at its estimated residual value at the end of 4th year. *Value from present value of $1 table. **Estimated residual value of the proposal L at the end of 4th year. The residual (or salvage) value estimated at any point of time might be different from the total expected future cash inflow to be generated by the proposal. In this exercise, the total expected cash inflow of years 5, 6 and 7 is $80,000 (= $30,000 + $30,000 + $20,000) but we have estimated a residual value of $60,000 at the end of year 4. Such valuations are usually made by management or an independent expert valuer. *Value from present value of an annuity of $1 in arrears table. 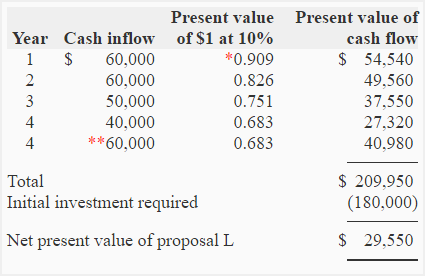 Proposal L looks more desirable because its net present value is more than that of proposal M.
i dnt understand ..y we had taken the value of 60k …in the proposal L..? It is the estimated residual value. The estimated residual value of the proposal is not essentially equal to the total expected future cash inflow.